Cliodhna is Founder and Director of ACTING UP! which began as an early years arts advocacy consultancy predominantly based in Cork and then transformed into a production company and event organisation leader for theatre and storytelling for early years. 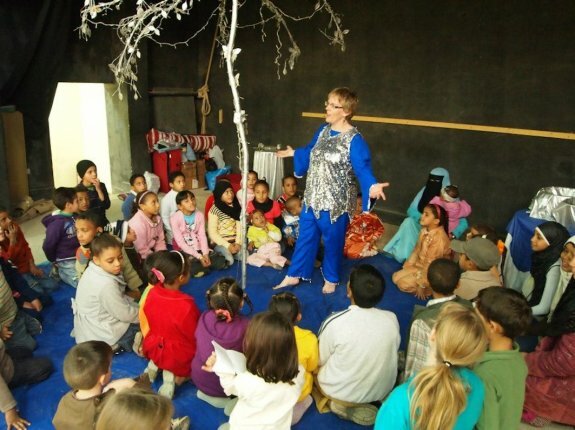 Cliodhna has written, produced and performed two small size shows for children aged 0-3 years and their carers (SILVER TREE and DREAMTRAIN) which continue to be programmed as part of Festivals nationwide and in alternative theatre spaces. Most recently, she has joined the superb Sticky Fingers team at the Children’s Art House in Newry lead by Grainne Powell, where she has a workshop space suitable for early years productions, arts activities and storytelling sessions. Are you there, Ireland, it’s me - Cliodhna! I am absolutely delighted to be guest editor on this edition of Practice.ie. As most of you who know me will be aware, I have an avid interest in promoting the value of early years arts and performances across Ireland, Europe and further afield. I attended my first performance with my son, who was then eighteen months old, in 2007 in Bucharest, Romania. I have always loved the theatre and I have never been too far from the stage as a workplace. I was looking for an event where children so small would be welcome and I stumbled accidentally on this marvellous performance, "I colori dell’acqua" as part of what was a Small Size festival in Romania at the time. The show was life-changing, the training workshop that followed with Valeria Frabetti gave me a direction for the future and my life since then has been an open book on the shelf of the Small Size library! During the course of my editorship over the next two months, I would like to highlight what has been happening on the island of Ireland, in terms of the Small Size network, what is presently being explored as arts practice within the early years sector and what is coming in the near future in terms of training and experience for performers and teachers within the sectors of education and the arts, but focussing on audiences aged 0-6 years. I believe strongly in the models of partnership which have produced quality events to date and the contributors will be drawn from both the artistic and the educational sectors. I will stitch a patchwork quilt together of the events and talkshops which have been instrumental in bringing arts for early years to the forefront of a general arts discussion and I hope that we can share the warmth of these contributions to create a story that will be told for many generations to come.